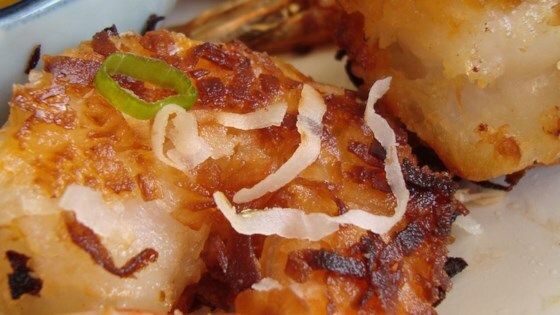 "Shrimp that are dipped in a scrumptious batter, rolled in coconut, fried, then baked. The dipping sauce is the clincher: marmalade, honey, hot sauce and mustard!" Mix together flour, cornstarch, salt and white pepper. Add 2 tablespoons of vegetable oil and the ice water. Stir to blend. Pour the coconut into a shallow pan. Dip the shrimp one at a time into the batter, then roll the shrimp in the coconut. Once coated, place each shrimp into a frying pan of oil heated to 350 degrees F (175 degrees C). Fry the shrimp in the hot oil until lightly browned; about 4 minutes. Bake the fried shrimp in a preheated 300 degrees F (150 degrees C) oven for 5 minutes. Make the dipping sauce: combine marmalade, mustard, honey and hot sauce in a small bowl. Mix well. Serve the shrimp and dipping sauce side by side.